Peter Smith, Wanstead’s greengrocer for 40 years, has announced his retirement and closed hisÂ shop early on Thursday afternoon. The business is changing hands but will continue trading as a greengrocer. 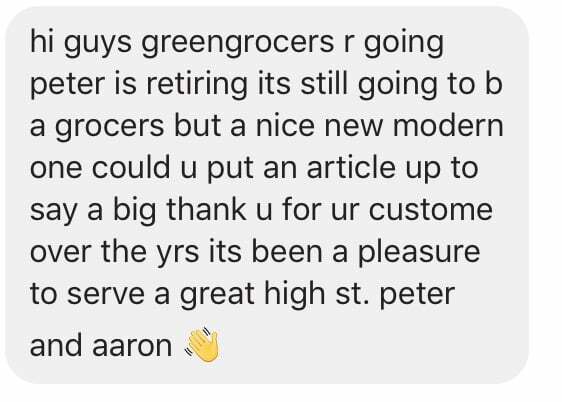 Peter, and Aaron Hebden, who also worked at the shop, announced the departure in a message to their customers viaÂ Wansteadium which thanked them for their support. 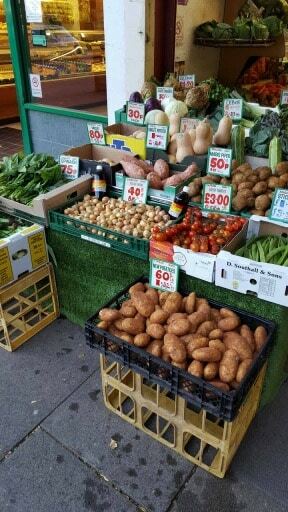 The closure of the greengrocers has long been a fear of many Wanstead High Street shoppers, with rumours of its closure circulating many times, often sparked by the increase in rents for High Street shops.Â Until today they have just been rumours. Aaron said a “nice family” was taking over. Â More details when we have them. Not really a surprise. Peter has been pretty down ever since the butcher closed and his customer numbers fell as a result. He’d reduced the range of his stock too. Could never fault him and the guys for friendliness though. Always good for a chat about football and rugby. Hopefully the new owners will keep that tradition going. thank u guys we had a great time serving u all. I can’t believe you didn’t let us say goodbye! Good luck – what will you do Aaron? This is really bad news – Peter was one of the stalwarts of Wanstead High St and a regular stop on my shopping expeditions. Good luck, Peter and Aaron, whatever you decide to do next. I’ll really miss you. Sad news. Thanks for 13 years of top quality fruit and veg, and friendly chats too. We’ll miss you guys, and Brian too. Good luck for the future. Am saddened and shocked. What a terrible shame. We’re going to really miss you guys. Good luck for the future. Peter, the very best of luck for the future: Chris, Lyn and mum ! Sorry not to say goodbye, wondered why it was shut today. Thanks for everything Pete. Including use of your phone! Rubbish news. Good luck Peter. So sorry not to say goodbye. Thanks for the use of your phone! Pete, Aaron & Brian my visits to the High Street will never be the same without you. My home made apricot jam on croissant will now be tinged with sadness – the last fruit I bought from you. Best wishes for the future to you all. Really sorry to hear this and a shame we could not say goodbye to you all. You will be missed. One of the reasons I moved to Wanstead was the traditional high street shops and I remember the friendliness in Peter’s shop when I first shopped there. I liked the shop just as it is, and I don’t need to pay by card everywhere. I always enjoyed a chat with them too! I know the closure of the butcher affected the footfall in the High Street so frankly not surprised at this. Enjoy your retirement Peter and good luck to Aaron for the future, hope you get fixed up soon. Sorry to see you go. My son loved going in your shop. Always friendly and helpful. Hopefully your legacy will continue in the shop. Thank you for letting Ethan help himself to your fruits!!! He and rest of us will miss you! Best of luck for the future! A big chunk of the High Street’s character lost here. Such a shame and could easily have held it’s own alongside newcomers like the Pig. Truly sad news – for us. Hopefully a new lease of life for you. Thanks to you all, sincerely, from Julia, Joe and meself. Bless you and those who sail with you. Up The Hammers! So sad to see you go. Karen and I will miss you all. Aaron told me about the council wanting to charge you to put your displays on the pavement – outrageous! Guess it was the last straw. Anyway enjoy a happy retirement – more time to spend in Dovercourt. Hope you get fixed up soon with a new job Aaron. Pete, hopefully we’ll bump into each other in the Nightingale. Awww such a shame to see you go Peter and Aaron! Always dropped in for fresh fruit and veggies … you will be missed. Good luck! Independent shops are out….Independent countries are in, apparently. Mini Waitrose or M&S Food micro shop maybe? Let’s hope not – two mini supermarkets already is enough – possibly a third if Sainsbury’s has a change of heart about the old Barclay’s. 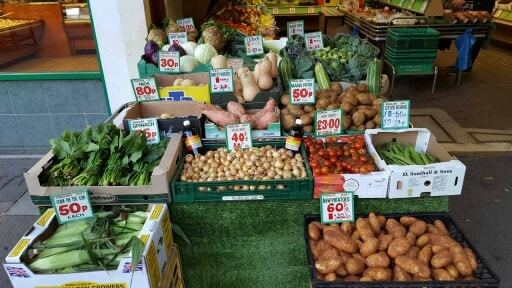 A specialist greengrocer is what the high street needs. So sorry to see you guys go, you really will be sorely missed! It was an absolute pleasure to pop in and get our fruit and veg as you all are so friendly and kind (especially to my very small boys). Wishing you all the best for the future. Good luck with everything and take care. Oh Pete and Aaron we knew that it had to happen, but are so sorry not to have been able to say goodbye in person. We’ll miss all that great fruit and veg, but almost more so all those chats putting the world to rights. And who will Brian find now Aaron to commiserate with him on the state of play with Wolves !! Every best wish for your well-deserved retirement Pete. And good luck Aaron for whatever you plan to do in the future. Hope to see you both again some time.